The front and side supplemental restraint systems (SRS) include up to 6 air bags. 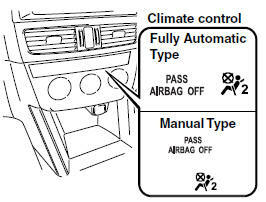 Please verify which kinds of air bags are equipped on your vehicle by locating the “SRS AIRBAG” location indicators. These indicators are visible in the area where the air bags are installed. Vehicles with the Driver and Front Passenger Occupant Classification System have a sensor which detects an impending roll-over accident. Without seat belt usage, the air bags cannot provide adequate protection during an accident. • Keep the occupant from being thrown into an inflating air bag. • Reduce the possibility of injuries during an accident that is not designed for air bag inflation, such as rear impact. • Reduce the possibility of injuries in frontal, near frontal or side collisions or roll-over accidents that are not severe enough to activate the air bags. • Reduce the possibility of being thrown from your vehicle. • Reduce the possibility of injuries to lower body and legs during an accident because the air bags provide no protection to these parts of the body. • Hold the driver in a position which allows better control of the vehicle. If your vehicle is also equipped with a driver and front passenger occupant classification system, refer to the Driver and Front Passenger Occupant Classification System for details. If your vehicle is equipped with a driver and front passenger occupant classification system, the front passenger air bag deactivation indicator light illuminates for a specified time after the ignition is switched ON. Seat belts must be worn in air bag equipped vehicles: Depending only on the air bags for protection during an accident is dangerous. Alone, air bags may not prevent serious injuries. The appropriate air bags can be expected to inflate only in the first accident, such as frontal, near frontal or side collisions or roll-over accident that are at least moderate. Vehicle occupants should always wear seat belts. Rear-facing child-restraint systems on the front seat are particularly dangerous even though you may feel assured that a front passenger air bag will not deploy based on the fact that the front passenger air bag deactivation indicator light illuminates. The child-restraint system can be hit by a deploying air bag and moved violently backward resulting in serious injury or death to the child. Do not sit too close to the driver and front passenger air bags: Sitting too close to the driver and front passenger air bag modules or placing hands or feet on them is extremely dangerous. The driver and front passenger air bags inflate with great force and speed. Serious injuries could occur if someone is too close. The driver should always hold onto only the rim of the steering wheel. The front seat passenger should keep both feet on the floor. Front seat occupants should adjust their seats as far back as possible and always sit upright against the seatbacks with seat belts worn properly. Sit in the center of the seat and wear seat belts properly: Sitting too close to the side air bag modules or placing hands on them, or sleeping up against the door or hanging out the windows is extremely dangerous. The side and curtain air bags inflate with great force and speed directly expanding along the door on the side the car is hit. Serious injury could occur if someone is sitting too close to the door or leaning against a window, or if rear seat occupants grab the sides of the front seatbacks. Give the side and curtain air bags room to work by sitting in the center of the seat while the vehicle is moving with seat belts worn properly. Attaching an object to the driver and front passenger air bag modules or placing something in front of them is dangerous. In an accident, an object could interfere with air bag inflation and injure the occupants. Do not attach objects on or around the area where a side air bag deploys: Attaching objects to the front seat in such a way as to cover the outboard side of the seat in any way is dangerous. In an accident the object could interfere with the side air bag, which inflates from the outboard side of the front seats, impeding the added protection of the side air bag system or redirecting the air bag in a way that is dangerous. Furthermore, the bag could be cut open releasing the gas. Do not hang net bags, map pouches or backpacks with side straps on the front seats. Never use seat covers on the front seats. Always keep the side air bag modules in your front seats free to deploy in the event of a side collision. Do not attach objects on or around the area where a curtain air bag deploys: Attaching objects to the areas where the curtain air bag activates such as on the windshield glass, side door glass, front and rear window pillars and along the roof edge and assist grips is dangerous. In an accident the object could interfere with the curtain air bag, which inflates from the front and rear window pillars and along the roof edge, impeding the added protection of the curtain air bag system or redirecting the air bag in a way that is dangerous. Furthermore, the bag could be cut open releasing the gas. Touching the components of the supplemental restraint system after the air bags have inflated is dangerous. Immediately after inflation, they are very hot. You could get burned. Never install any front-end equipment to your vehicle: Installation of front-end equipment, such as frontal protection bar (kangaroo bar, bull bar, push bar, or other similar devices), snowplow, or winches, is dangerous. The air bag crash sensor system could be affected. This could cause air bags to inflate unexpectedly, or it could prevent the air bags from inflating during an accident. Front occupants could be seriously injured. Do not modify the suspension: Modifying the vehicle suspension is dangerous. If the vehicle's height or the suspension is modified, the vehicle will be unable to accurately detect a collision or roll-over accident resulting in incorrect or unexpected air bag deployment and the possibility of serious injuries. ● Do not use tires or wheels other than those specified for your Mazda: Use of any tire or wheel other than those specified for your Mazda is dangerous. Use of such wheels will prevent the vehicle's accident detections system from accurately detecting a collision or roll-over accident resulting in incorrect or unexpected air bag deployment and the possibility of serious injuries. ● Do not overload your vehicle: Overloading your vehicle is dangerous as it could prevent the air bag crash sensor system from accurately detecting a collision or roll-over accident resulting in incorrect or unexpected air bag deployment and the possibility of serious injuries. The gross axle weight rating (GAWR) and the gross vehicle weight rating (GVWR) for your vehicle are on the Motor Vehicle Safety Standard Label on the driver's door frame. Do not exceed these ratings. ● Do not drive the vehicle off-road: Driving your Mazda off-road is dangerous because the vehicle has not been designed to do so. Driving the vehicle off-road could prevent the air bag crash sensor system from accurately detecting a collision or roll-over accident resulting in incorrect or unexpected air bag deployment and the possibility of serious injuries. Do not modify a front door or leave any damage unrepaired. Always have an Authorized Mazda Dealer inspect a damaged front door: Modifying a front door or leaving any damage unrepaired is dangerous. Each front door has a side crash sensor as a component of the supplemental restraint system. If holes are drilled in a front door, a door speaker is left removed, or a damaged door is left unrepaired, the sensor could be adversely affected causing it to not detect the pressure of an impact correctly during a side collision. If a sensor does not detect a side impact correctly, the side and curtain air bags and the front seat belt pretensioner may not operate normally which could result in serious injury to occupants. Do not modify the supplemental restraint system: Modifying the components or wiring of the supplemental restraint system is dangerous. You could accidentally activate it or make it inoperable. Do not make any modifications to the supplemental restraint system. This includes installing trim, badges, or anything else over the air bag modules. It also includes installing extra electrical equipment on or near system components or wiring. An Authorized Mazda Dealer can provide the special care needed in the removal and installation of front seats. It is important to protect the air bag wiring and connections to assure that the bags do not accidentally deploy and that the seats retain an undamaged air bag connection. Do not operate a vehicle with damaged air bag/seat belt pretensioner system components: Expended or damaged air bag/seat belt pretensioner system components must be replaced after any collision which caused them to deploy or damage them. Only a trained Authorized Mazda Dealer can fully evaluate these systems to see that they will work in any subsequent accident. Driving with an expended or damaged air bag or pretensioner unit will not afford you the necessary protection in the event of any subsequent accident which could result in serious injury or death. Do not remove interior air bag parts: Removing any components such as the front seats, front dashboard, the steering wheel or parts on the front and rear window pillars and along the roof edge, containing air bag parts or sensors is dangerous. These parts contain essential air bag components. The air bag could accidentally activate and cause serious injuries. Always have an Authorized Mazda Dealer remove these parts. Properly dispose of the air bag system: Improper disposal of an air bag or a vehicle with live air bags in it can be extremely dangerous. Unless all safety procedures are followed, injury could result. Have an Authorized Mazda Dealer safely dispose of the air bag system or scrap a an air bag equipped vehicle. • If it becomes necessary to have the components or wiring system for the supplementary restraint system modified to accommodate a person with certain medical conditions in accordance with a certified physician, contact an Authorized Mazda Dealer, refer to “Customer Assistance (U.S.A.)” . • When an air bag deploys, a loud inflation noise can be heard and some smoke will be released. Neither is likely to cause injury, however, the texture of the air bags may cause light skin injuries on body parts not covered with clothing through friction. • Should you sell your Mazda, we urge you to tell the new owner of its air bag systems and that familiarization with all instructions about them, from the Owner's Manual, is important. • This highly-visible label is displayed which warns against the use of rear-facing child-restraint systems on the front passenger seat.